We live in times of continuous stress in our personal and professional lives — time conflicts, imbalance between “doing and being,” exposed to too much information, multitasking and less connected to others than ever. Why are some people more resistant to stress than others? How can we become more resilient? and homeostasis. The metaphor of a hunter’s bow can be helpful. If we pull the bow taut and overstrain it, resilience is lost and the bow breaks. So do our bodies and minds when they are under stress, eventually leading to “dis-eases” or illness. is what determines our ability to integrate them. Circumstances are always neutral. Most stress is created by our mind, which monitors and regulates the flow of energy and information we create or are exposed to. What is needed for us to respond in a healthy way? Relaxation exercises, meditation, embodied awareness movement and yoga, beneficial communication skills, cultivating loving kindness and compassion for oneself and others are essential for us to flourish. Exercising the muscles of the mind and heart of compassion are necessary, because the body and the mind are one. The word mindfulness is being bandied about, but what does it mean, and what is the big deal? The extraordinary research that is being done all over the world on mindfulness versus mindlessness, the robotic state of stress, is showing actual differences in the brain, called neuroplasticity. In the eight-week course on learning mindfulness meditation, it is shown that what we attend to, or give our attention and awareness, in fact imprints our neural pathways. What this means is that if we focus all day long on what we don’t want, we are attending to sabotaging patterns. Mindfulness makes us aware of our own internal stuck programs and gives us the tools to shift back into the present moment. Being in the present moment detoxes us by resourcing. It’s like going to the beach and watching the tide. The waves roll in, roll out. Rhythmic, lulling, majestic. You feel it after chilling. Your heart slows. The breathing deepens. You feel part of the present. This is mindfulness. Coming home to inside. We can’t always go to the beach, but we can train our minds to come back again and again to the breath. To this moment. 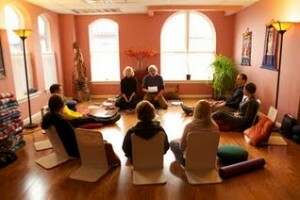 Dr. Selma Nemer is a licensed psychologist at One Roof and co-facilitator the Saratoga Stress Reduction Program, now in its tenth year of operation. New classes begin in September. Like so many in our beautiful small town, I knew Mana Behan for over 20 years. She made me feel special. She made me feel chosen, and at the same time empowered. But this is not my story; this is the story of hundreds who knew her. This was her gift to all who knew her. These were the words that echoed across Saratoga: compassionate, maternal, authentic, and real. After Mana died, the Universe began testing me, and I found myself asking, What would Mana do? over and over. What I wanted to say after Mana Behan died, I held in, which she would never have done. So here I am rewriting the blog about Mana’s passing on her Birthday. The last time I saw her here in our offices, I was struggling with our website. A glitch would not allow me to upload a new practitioner’s photo. On my third try, refreshing the page, I was becoming more than frustrated. In came elfin Mana. She said, “Maybe this means you should step away from it for awhile,” in language not unlike Yodda’s. “No!” I fumed, “I’ve got to figure this out!” I shot lasers of hate at the computer screen in hopes of completing the upload. Of course this did not help, and Mana floated out of the room, as I picked up the phone to call our web hosting company. Fifteen minutes later Mana stood across from me at my desk, bent over deeply, and pounded her palm against the wood like a judge with a gavel. She shouted, “Look at me!” I jumped, and looked up to find myself nose to nose with her, staring at her blue eyes, which suddenly softened into a gentle smile. “Kiss me!” she demanded, and before I knew it she planted one on me and disappeared. I was weak with love. That was the last time I saw her.